NB. same price online too but there's postage on top. I was in my local Homebase store looking for some metal hollow fixings. I saw this pack of 3 lots of different fixings and thought it was a misprice because the 25x M4 fixings (which are included in this set) cost £15.99 on their own at homebase! Add the X3 metal fixings (x25) which cost £6.99 and the 40 plastic rawplugs which are also included (they cost about £4.99) and that's quite a saving. Plus they come in a handy case too. I can't find the plastic rawplugs seperately online unfortunately. I can't find the 40 plastic rawplugs seperately online unfortunately. very handy - just what im looking for as I gotta hang some lights from the ceiling. Great offer. Reserve and collect wouldn't work for me though (error message). All reserved. Perfect for the jobs I've got to do. Pack includes only 35 screws/nails and a whopping 90(!) fixings! I doubt anyone would waste more than double their fixings, especially as they will ruin your wall if installed poorly. Considering it only includes 10 of the M4 fixings. i'd say screwfix could do a MUCH better deal. Cold from mePack includes only 35 screws/nails and a whopping 90(!) … Cold from mePack includes only 35 screws/nails and a whopping 90(!) fixings! I doubt anyone would waste more than double their fixings, especially as they will ruin your wall if installed poorly.Considering it only includes 10 of the M4 fixings. i'd say screwfix could do a MUCH better deal.Sorry op. What? There are 25 M4 fixings and 25 X3 fixings PLUS 40 PLASTIC rawplugs. 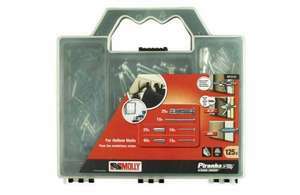 This Black and Decker Molly Piranha Fixings Kit is ideal for use before putting screws into a wall. Size of screw head accepted: 8mm. Length of fixings: 30mm, 33mm, and 20mm. Kit includes: 90 assorted fixings and 35 assorted screws. Oh crap! You are right! What a load of rubbish that is. Why on earth do they not contain enough M4's etc.? It makes no sense? I'm going to take mine back then. But its only the screws.. They are 2 a penny. The most expensive bit is the fixings themselves, so I am not overly conerned that there arn't enough screws as I have a cupboard full of almost every shape/size/pitch of screws.. So its still a good deal for me.. But its only the screws.. They are 2 a penny. The most expensive bit is … But its only the screws.. They are 2 a penny. The most expensive bit is the fixings themselves, so I am not overly conerned that there arn't enough screws as I have a cupboard full of almost every shape/size/pitch of screws.. So its still a good deal for me..
Agree'd.... You can spend a fortune on bolt hollow wall fixings. Best I have found is Screwfix for quality and price. What am I missing here.. M4 screws/bolts are cheap as chips.. Screwfix do a pack of 25 for less than £2 (OK perhaps not as cheap as chips and certainly not 2 a penny).. But since they have so many other uses, they are good to have around. Perhaps I am just being a bit flippant since I already have a stash of them.. I guess if you dont and have to buy them, this adds to the overall cost of the deal!